Candy chucker – weapon, or advanced Halloween delivery system? Now we know why kids in this neighborhood wear plastic Halloween masks instead of just painting their faces. They’re trying to protect themselves from the onslaught of hard candy spewing out the front of this candy chucking pumpkin. The mechanism operates very much like a baseball or football throwing device. Now that we think of it, it’s also the same concept as the chicken launcher. There is a feed shoot that drops the projectile into the grips of two spinning chuckers. Those chuckers are built out of a couple of fans, with layers of fabric to account for different sizes and shapes of candy. The video after the break shows some test firing. We love the sickening ‘whap!’ that the Werther’s Original (or whatever crappy Halloween offering they’re using) makes when it slams into the wall of the room. This thing’s just begging to be mounted on a parade float, don’t you think? “chute” not shoot. come on, editors, edit! Reminds me of the Halloween that I found out those jaw breakers were a very nice fit to a short piece of pvc that was part of my costume. That’s a lawsuit waiting to happen, a tasty, tasty lawsuit. Reports tell of boy eating candy embedded in girls eye. using fans….ouch. Similar to a baseball pitching machine — my coach used to stand behind a steel cage when running this sucker…we wore helmets and a ready eye…every now and then someone got bruised. 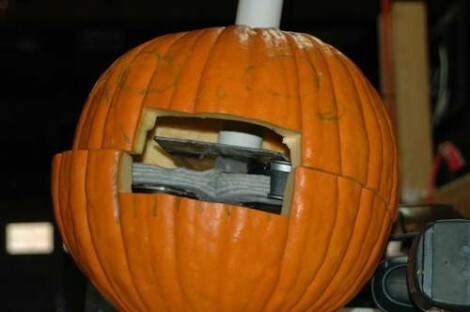 Trick-or-treaters are probably going to get one in the eye…fun, but a really, really bad idea. Think lawyers. And angry women. Yikes. This is something I would never have expected to see in HaD, not even in comments. This is very sad and alarming. I wonder, could it be used as a bead shooter for Mardi Gras? Shooting candy off the floats would be cool too. I’ve been pegged pretty hard by over exuberant bead/candy throwers many times, I think this thing may be way more civilized! Wind-speed, Velocity, angle of incident and Gravity accounted for? “One shot, One kill” (Or Cavity. Paraphrase: eye, ear, nose, throat, et cetera).